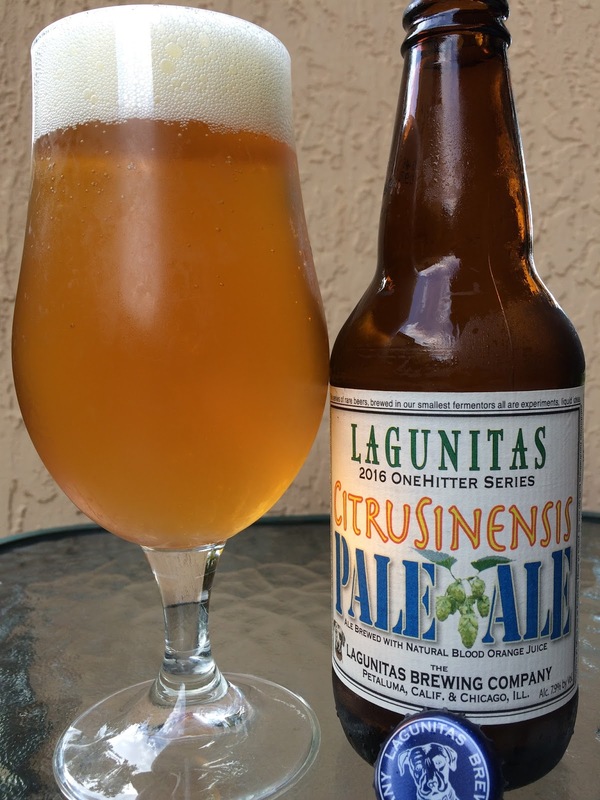 A new hoppy and fruity Lagunitas beer? Hell yeah! You know this is going to be good! Of course I'm talking about CitruSinensis Pale Ale, brewed with blood orange juice. This beer is a member of Lagunitas's 2016 OneHitter Series. Around the edge of the label... "There's no shame in being a One-Hit Wonder. It's hard to be right even once. This series of rare beers, brewed in our smallest fermentors all are experiments, liquid ideas, salubrious ruminations built on our 23 years of edgy brewing at the edge of brewing." 7.9% alcohol. Bright, tropical tangerine aroma. Super juicy flavors, full of tropical oranges and hints of pineapple. Citrus, nicely tangy. Light hoppy bitterness at the finish. Alcohol was totally disguised. Fairly simple but very good!